This week's vlog includes a 7-minute teaching warm-up and transitions into my reflection of the week; as well as my feelings about working and teaching at title 1 schools. When I first started A Week in the Life of a Teacher vlogs (17-18), I filmed and incorporated teaching clips in my videos. I did this because there had not been, to my knowledge, another teacher vlogger that had (consistently) done so. I also wanted to use my vlogs to share ideas and also reflect on my own teaching. I've spent a majority of my career working with or teaching at title 1 schools and I wanted to see where I could develop to support all students. However, teaching Pre-AP chemistry for the first time in 8 years combined with teaching at a Title 1 school and daily vlogging and editing for a weekly vlog release began to take its toll on me mentally and physically. Therefore, during the spring semester, I continued to record my lessons for self-reflection, but I didn't stress about editing hours of lessons for the A Week in the Life of a Teacher vlog. This school year (18-19), I decided to scale back the amount of time I spent vlogging. For the most part, I record on a single day and reflect on the week or some topic that people have asked me about. I feel this schedule allows me to rest, relax, and not stress about additional work. Although, I have made the decision to try and incorporate small segments of instruction from one lesson taught during my weekly vlog release. I this will allow me to support my original goals and provide a lens to anyone who is interested in teaching, especially at Title 1 schools. For the record, just in case this needs to be stated, I do not believe Title 1 schools are terrible. There are multiple challenges that make teaching at a Title 1 school difficult. However, I enjoy working with the population of students that I serve and understand the commitment and dedication it takes to support them academically and emotionally. The Facebook post can't even describe how tired I was after my first week back to school. However, I had a great first week. You can check out a bit more through my 2018-2019 First Week of School vlog. Did you hear that? It was the sound of summer vacation speeding past us like a race car on the Indy 500! Many teachers started or are about to begin their 2018-2019 school year. 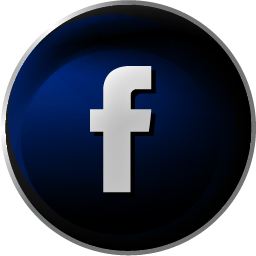 If you weren't aware, check out Facebook or Instagram for hundreds of posts about classroom hauls, makeovers, and tours. Don't worry, mine will be coming soon! I am fortunate to have an opportunity to collaborate with a fantastic group of secondary science teacher-authors. 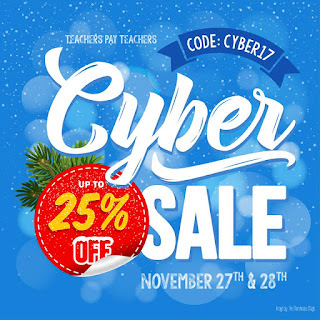 We have come together to give away four (4) $100 Teachers Pay Teachers gift cards. 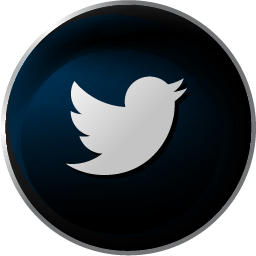 Additionally, many of us are hosting our own giveaways. Therefore, you the chance of winning hundreds of dollars worth of prizes. I will be giving away two (2) of my Chemistry Blended Learning Stations Bundle. 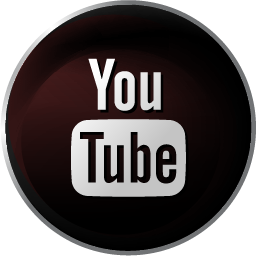 You can check out several of my vlogs on YouTube where I've shown and talked about the implementation of the stations in the classroom. 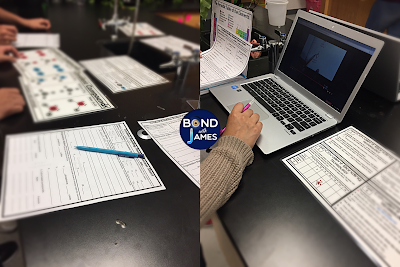 Students are engaged and challenged throughout each stations activity set; they're all great activities to use during a formal evaluation. Hop from blog to blog (links at the bottom). 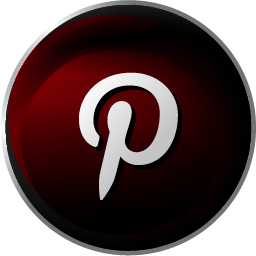 Each blog has a secret word. Gather the secret words to create a sentence. For my giveaway, follow the instructions in the KingSumo Giveaway. Make sure you hop to all of the blogs to pick up the secret words, figure out the sentence, and enter them in the Raffle below! 10. Secondary Science 2018 Giveaway! A Week in the Life of a Teacher (Week 15): Skipping Curriculum & A Snow Day?! So, I skipped parts of the chemistry curriculum. I realized that I spent too much time at the beginning of the year reviewing math skills because many of my students were struggling in that area. It's also been seven years since I last taught chemistry. I'm rusty and I'm okay with that. I think the important thing is that I came up with a plan halfway through the semester to determine what I was going to cover, what I would push back and cycle in when I had the opportunity, and what I was okay with cutting out of the curriculum this school year. I could worry about it and beat myself up, but where would that leave me? I'd be an anxious mess, and I refuse to allow myself to feel like that. On Monday and Tuesday, my students worked on the Covalent Bonding Student Learning Stations. My A-Day classes started last Friday and were finishing up. My B-Day courses were starting them for the first time. The stations served as a review because the students had taken notes the class period before. The only issue I ran into was that this week was also our state's End-of-Course (standardized exam) re-test week. I had a few students that had to re-take one or more of the EOC exams and missed class. On Wednesday, I covered molecular geometry with my A-Day students. It is the final concept that my students will learn for the fall semester. Before students took notes, I had them set up one last graphic organizer into their interactive notebook. The notes were short because students already had experience drawing a few chemical structures. However, they were unfamiliar with molecular geometries. I quickly explained how to use a reference sheet and then students had an opportunity to draw the rest of the structures using whiteboards. During this time I walked around and assisted students as needed. Unfortunately, I'm facing a bit of a dilemma. School was canceled on Friday (because the city experienced snow for the first time in years). My B-Day students weren't able to receive the lecture over the new content. I only have one more class period with them before they take the final next week. I was going to use our last full class period to review, but now I will have to give them an accelerated version of the notes. The semester is coming to an end and I cannot wait! I need a break. I'm sure we all do. As always, thanks for stopping by. I'd love to hear from you. Tag me @bondwithjames on Facebook, Instagram, or Twitter and let me know how my ideas or products are working to help your students! A Week in the Life of a Teacher (Week 14): Unannounced Observation & The Dancing Teacher?! My students and I returned from Thanksgiving break. This week also marks the first time that I released two vlogs in one week. 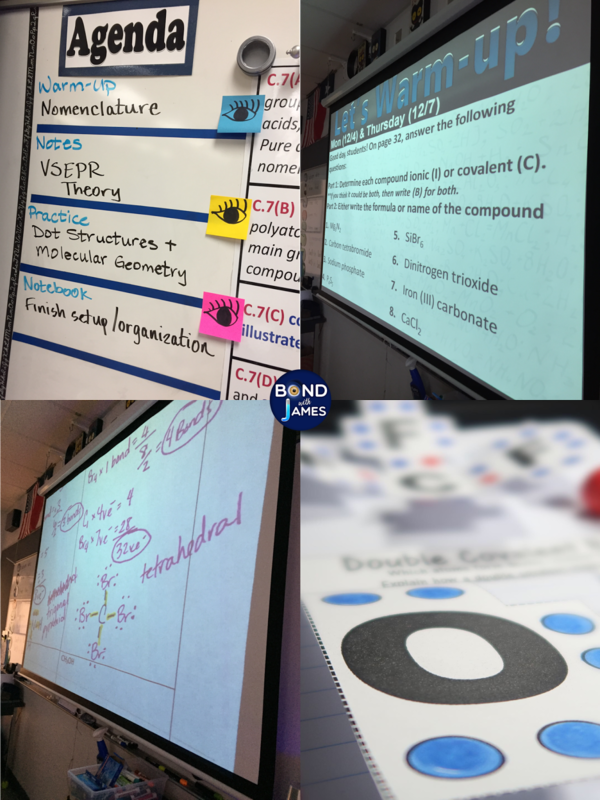 On Monday and Tuesday, my students participated in an inquiry activity that introduced them to the concept covalent bonding and covalent compounds. While I've used molecular model kits in the past (7 years ago), this was the first time that I was going to allow students to explore the models before delivering instruction over the content. Overall, I felt it went well. 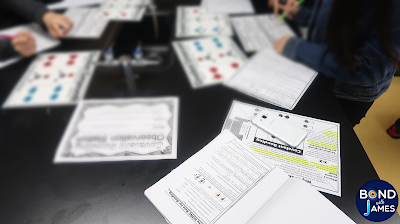 Unfortunately, I had to cut the time spent on the activity short because I needed students to put together their interactive notebooks over covalent bonding. 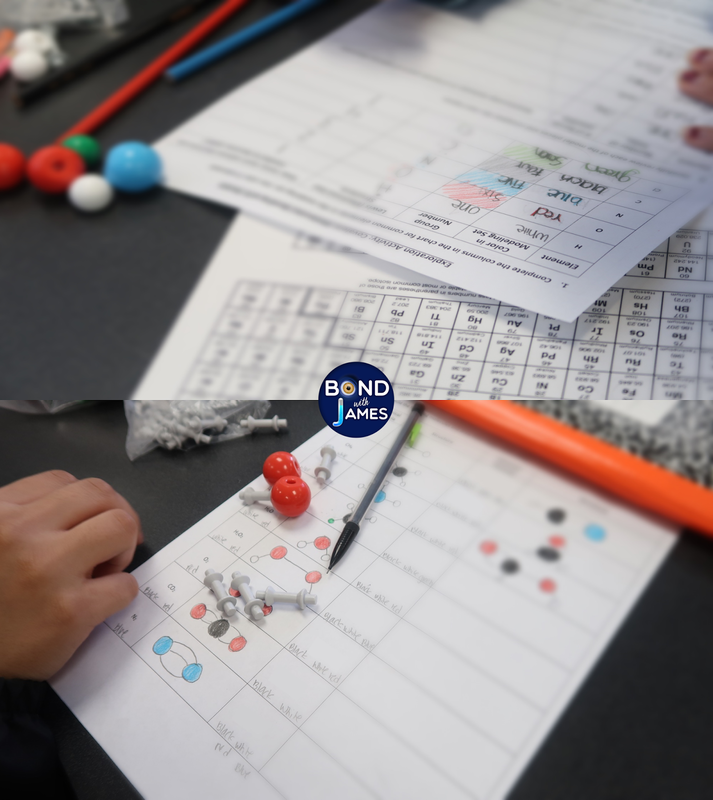 We are going to use the pieces again to cover molecular shapes, and so students will have another opportunity to interact with the pieces after they have gained additional information about covalent bonding. I also had an unannounced observation on Tuesday. I predicted that it would happen during the final weeks of the semester. Overall, I felt it went well. Some people commented that they felt it was unfair to have an observation immediately returning from the Thanksgiving holiday. I didn't mind, and I also understand the life of an administrator, so it wasn't a big deal for me. Had I not been prepared then I might be singing a different tune. 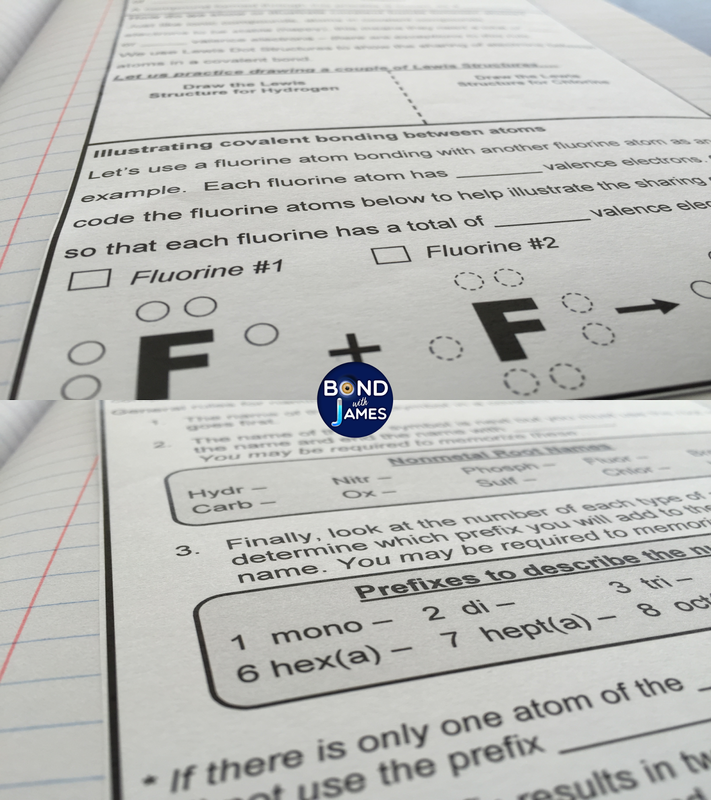 On Wednesday and Thursday, my students took notes over covalent compounds and bonding. Not only did I do a little dance for my students, which you can see in the first 6-seconds of the vlog, but I also showed them a trick to help recognize (generally speaking) whether a compound is ionic or covalent. That tip may also be seen in the vlog. On Friday, my A-Day classes participated in another stations activity set, the Covalent Bonding Student Learning Stations. I accidentally left the colored station signs at home - which is probably why I didn't take a bunch of pictures that day. However, I was also making sure I was checking in with each student individually to ensure they understood the concepts. My B-Day classes will start the stations on Tuesday and so I am looking forward to another opportunity to work with students during the activity set. If you're interested in the individual activities, click on the links below to find out what other teachers are saying about the quality of the resources! I always seem to get sick whenever there is a long break from work, and I have plans to be (super) productive! I don't have much to write about this week. 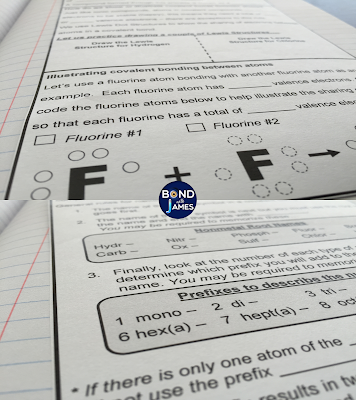 I had planned to read and grade my student writing samples from the Ionic Bonding Student Learning Stations. Unfortunately, I had to spend my final day of the fall break doing that. However, I was presently surprised by many of the selections. There were four task cards, and each card was a certain number of points. 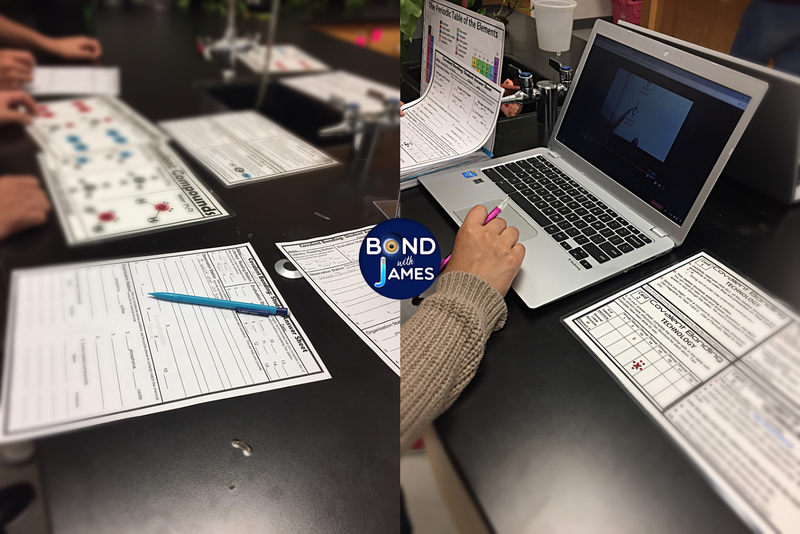 Students had to earn 25 points, so that meant they had to select at least two of the four task cards to finish. Students could receive up to 50 points, but they had to complete all four writing prompts by the due date. Originally, I was going to mark on them, but the samples were so good that I decided to leave comments on Post-It notes. Next time I will skim through and make photocopies so that I can have unmarked work to use as exemplars in the future. To end out my fall break, I shot another Facebook LIVE. I sometimes feel like I'm dying to get through a LIVE session and then I watch it back and think, "Oh...it wasn't that bad at all." Or, at least that is my own perception. You can check out the FB LIVE below to gain an idea of what I will be doing for the upcoming week! Start stocking up on your wishlist items now! Oh, by-the-way. If you don't know - you can earn credit towards your purchases by leaving (constructive) feedback on a teacher-author's TpT page. You can do this for previous or newly purchased items. When you log into your account, go to your My Purchases and scroll through your items. You should see a link that reads "Provide Feedback". It's that simple.